Making a choice to pursue a new avenue in life involves several actions: doing it, doing it later, or choosing to not do it at all. Doing it now is the best choice, as long as we have a solid plan in place. A plan that includes specific and measurable goals to keep us on track. With this in place we remain focused on the outcome, and we do not walk down paths that lead us astray from our vision — picture a straight road versus a narrow one with sharp curves and branches that leave us wondering which way to go. The decisions that we make in life that are “on a whim” are usually things that we have always wanted to do, but fear had always stood in our way. Think about that! Not doing it at all is a good choice when we know our goal is not meant to be. These are dreams that make no sense at all, not even to ourselves, and they always lead to bad outcomes. Doing it later can be a very dangerous choice if filled with procrastination. A decision to move ahead later, accompanied with a measurable and dated plan is smart, but we often allow excuses to follow close behind. I will do this after I feel less stress. I will do this when I have more time. I need to feel (physically) better first. If you recognize yourself in any of these major excuses, ask yourself these questions: When will I not fear change? What is the worst thing that can happen if it does not work out? Does it matter what other people say? What would have to happen to make me feel less stress? When will I have more time? When will I feel better physically, and what can I do now to feel better/take a small step even though I do not feel 100%? How do I do it? I’ll do this after my kids leave home. I do not have the money. My house is not big enough/too small. I live in the wrong area. We make mountains of minor excuses. I call these types of excuses minor because they usually depend on some action in our life that is currently out of our immediate control (but are do-able or fixable). If you see yourself in any of these, or similar excuses, ask yourself: What can I do today to move one small step closer to making this happen? Is this a valid excuse, or can I move towards my goal today even though I am in these circumstances? Can I take a class next week (even a free one to just get started)? Can I rent a space, or a room? Can I rent a room out? Can I commute several times a week? How can I fund this today? How can I save a small amount of money beginning today? Can my children, or spouse, help me in large and small ways, and how do we/I implement that change? The day you take the first step, the day you take action, you are making the choice to move forward. You are in motion. 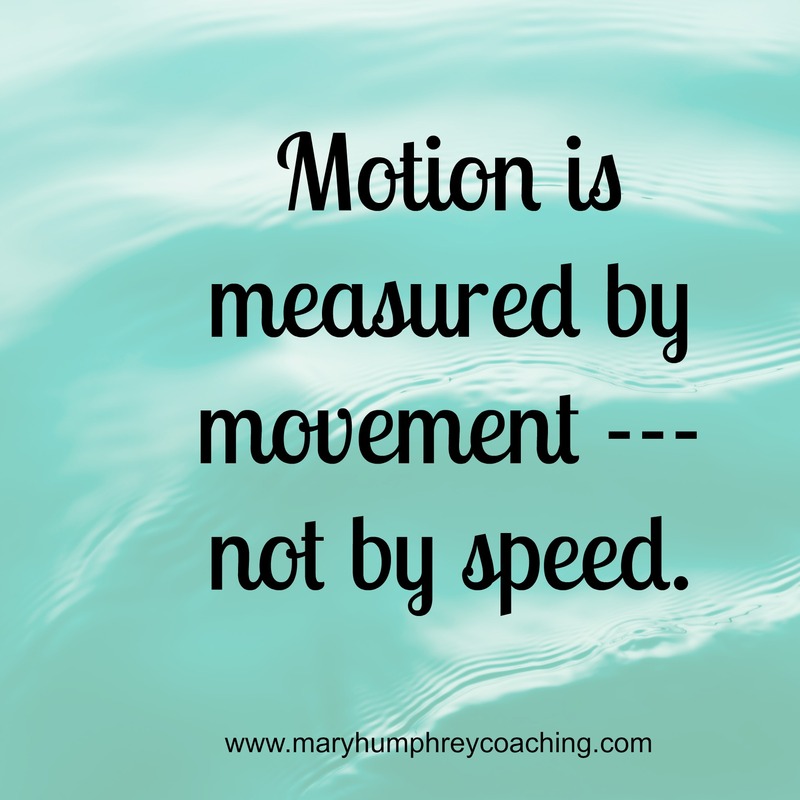 Motion is measured by movement — and not at all by speed! Paint your life masterpiece today! So very true, Mary! I learned long ago that excuses are just rationalized reasoning that gives us an out for doing or not doing something or to avoid change. And it is usually rooted in fear or pride or both. Making excuses doesn’t resolve an issue. It just keeps allows the issue to remain and keeps us where we are or sends us backwards. This is never a good thing. It actually takes away our choices. Who wants that? Not me! “Excuses are just rationalized reasoning that gives us an out…” I love that, Ginger!